Sen. Cory Booker (D., N.J.) announced Monday he is co-sponsoring Sen. Bernie Sanders' (I., Vt.) "Medicare for All," single-payer health care bill. Booker made the announcement Monday on New Jersey's NJTV News. The plan, entitled "Medicare for All," would expand the federal health care program Medicare, which currently covers disabled Americans and citizens age 65 and older, to all Americans. "You should not be punished because you are working-class or poor and be denied health care. 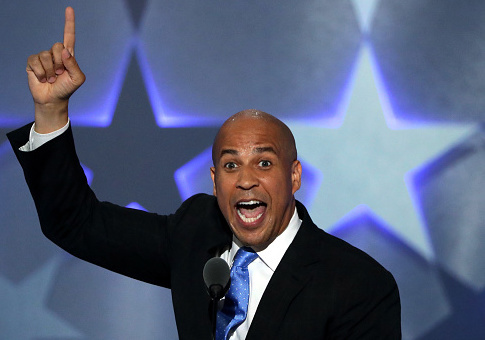 I think health care should be a right to all," said Booker. "This is something that’s got to happen. Obamacare was a first step in advancing this country, but I won’t rest until every American has a basic security that comes with having access to affordable health care." The plan has been estimated to cost $1.38 trillion per year, according to Sanders’ website. Sanders claims it would cost Americans over $6 trillion less than the current health care system over the next ten years. The program would be paid for with a combination of limiting tax deductions, and increasing income tax for the wealthy. Democratic Sens. Kamala Harris (Calif.) and Elizabeth Warren (Mass.) previously announced they are also co-sponsoring the Sanders bill, which will be introduced Wednesday. Harris, Warren, and Booker are all seen as top potential candidates for the Democratic presidential nomination in 2020, according to the Hill and other media reports. This entry was posted in Issues and tagged 2020 Election, Bernie Sanders, Cory Booker, Elizabeth Warren, Health Care, Health Insurance, Kamala Harris. Bookmark the permalink.